Black Panther is now my favorite movie! Was entertaining and action packed, but found it to be the weakest Marvel movie in a couple 3 years. I saw this movie 4 times and it never gets old! 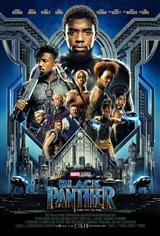 Black Panther is an amazing movie! Laughably bad acting and eye-roll inducing cliches, stereotypes and dialogue pretty much sums this train wreck up. This was an awesome and amazing movie. By far the best that I have ever seen. Keep it coming. I would love to see a sequel to the first movie. Now that the world is moving beyond the PC nonsense, they will admit, in the rear view mirror, this was horseshit. It's not very good on any level, and the pretense is ridiculous. At least with Iron man, you have the ability to believe there was discovery. ingenuity, and creative talent at work. Wakanda, is parked in the middle of a failed continent. Everyone there is a genius beyond any Einstein, and wealth unimaginable even to people of Asgard. Yet, they pretend to be poor to the outside world, and still accept charitable donations. Beyond the pretense, is the script. A comic book from the 40s might have these stilted dialogues, but today we expect a bit more. three out of 10 average. Full marks for CGI tho. Wonderful visuals, great story, surprising twists, great acting and well-developed characters. I've seen it 8 times and it never get's tired. A totally predictable plot, too long. I liked it. Not love it. It was good. It wasn't great. I fast forwarded it on some parts. The warrior women were the best. Wonderful realistic movie! Liked conviction, loyalty, and strength of entire cast performance which made the entire rendition seem non-fictional and authentic. Especially loved the roll of the female worriors! I posted an honest, review of the poor quality of this Movie. It was removed. This movie was not well made and I walked out before the end as did several others during the viewing that day. Still a fantastic movie. Wakanda forever. Okay if you're really young. Boring. Didn't care for it. Was hopeful. I liked the internal conflicts between the community sections. How something positive can become twisted and blurry, yet people will follow. The hero's willingness to do whats right and lay it all on the line. This is not a typical comic and was treated on the screen very well. I am happy they brought Black Panther into the main storyline and he will be a major contributor in the near future. Keep up the good work Marvel. wonderful plot with strong African females and males. This is the BEST Marvel movie ever made! Everyone in it did an EXCELLENT job! Just awful, marvel is milking every penny out of the hero craze. Easily the worst marvel movie. By the time I walked out I was the last person still in the theatre, everyone else had already walk out.